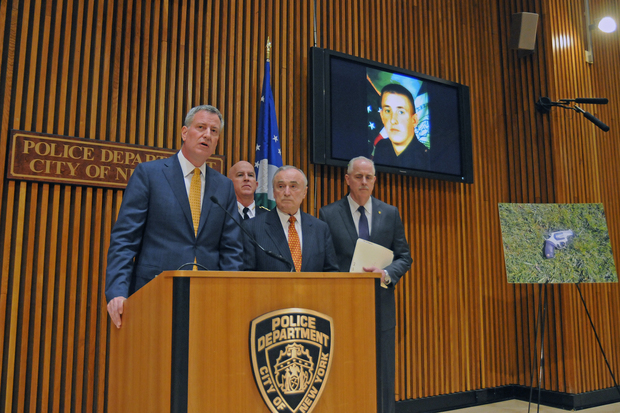 Mayor Bill de Blasio speaks at a press conference at NYPD headquarters with Commissioner Bill Bratton after Officer Brian Moore passed away from a gunshot would to his head, April 4, 2015. DOWNTOWN—Mayor Bill de Blasio said his relationship with the NYPD has improved considerably since a December low point where officers turned their backs on him at the funerals for two murdered officers. The remarks came after the police union, which excoriated the mayor for his response to Eric Garner's death, heaped praise on the mayor in recent days. "I think the whole city is in a better place today," de Blasio said Wednesday morning during an appearance on the MSNBC show "Morning Joe." "I think the tone has been much better." Following the shooting deaths of detectives Wenjian Liu and Rafael Ramos last December, the tone was toxic. Police union officials said the mayor helped to create the anti-police sentiment that led to the violence, with one union official, Patrolmen's Benevolent Association president Pat Lynch, going so far as to say de Blasio had "blood" on his hands. The criticism came after de Blasio had weeks earlier explained that he had to train his bi-racial son Dante on how to interact with police for his own safety. "I think it was understandable in a moment of tremendous pain, people felt deep, deep emotion," said de Blasio. "Two of our officers were assassinated in cold blood. I think everyone after that experience recognized we all have to move forward, find some way towards each other." After Officer Brian Moore was killed in Queens on Saturday, Lynch said he was "gratified" by de Blasio's "strong support for his police officers in these troubled times" and hoped for a "new era of unanimity" between police and the mayor. The change of heart came because de Blasio began to publicly support police with his rhetoric and policy actions, said one police union official who asked to remain anonymous. In the months since Liu and Ramos were slain, de Blasio has opposed legislation that would make the use of chokeholds a crime instead of just a violation of police department policy, told protesters that they must obey policy police commands and said protesters don't have the right to yell about killing police during protests. "It was tangible actions by the mayor that sent a message to the union that he was serious about improving the relationship," said the police union official. Alyssa Aguilera, political director for VOCAL-NY, said de Blasio's new approach is not going over well with groups who helped him develop the platform of police reform that got him elected. "I understand that he is the mayor and he needs to maintain a relationship with police but that shouldn't come at the detriment of the civil liberties and civil rights of peaceful protesters," said Aguilera. Aguilera said de Blasio's recent support of police seems to be "disingenuous pandering" to both sides. "I get that the turning of the backs was some serious bad press for him. I just wish this mayor, who got elected on a police reform agenda, would also spend some time to make sure the major reforms of his base who got him elected are also met." De Blasio said on MSNBC that the real issue is to "change the relationship" between the NYPD and communities "at the grass roots" level. The mayor said it was members of the community in Queens who helped point out Demetrius Blackwell, the 35-year-old felon charged with the murder of Moore. "I think the serious work is figuring out how we both reform policing, (and) reform the connection between police and community," said de Blasio. De Blasio is still very much walking the line between police and police reform advocates. The police union official said the relationship between de Blasio and police could easily devolve if they don't see continued support from the mayor. And not all city police unions are as effusive in their praise of the mayor as the PBA. "While we have started to see a change in Mayor de Blasio's relationship with the NYPD...there is always room for improvement," said vice-president of the Sergeants Benevolent Association Sgt. Robert Granley.